For many modern homes, the bathroom is no longer a utilitarian space. While bathrooms serve a functional purpose, they can also be a retreat, a personal space that provides comfort and relaxation. At N.P. Classic, we can either refresh your current space, leaving the same layout of counters, tub, shower and toilet, or start with a blank canvas to create a whole new look, complete with new custom cabinetry. A makeover can bring your home’s elegance and your sense of style to your bathroom. The results can transform how you think and about and use this space and boost its visual appeal. If you are interested in going green, we'll show you how we can design for high efficiency, low operating costs, and a minimal impact on the environment. If space allows, we can expand your bath area like those found in many of the new homes today. Many designs now include luxury amenities like oversized tubs, steam or rainfall showers, dressing tables and even a nook for gym equipment. If your space is constrained, a good design becomes even more important. But even if your room's footprint can't change, you can achieve a stunning new look and improve the flow or functionality. For example, even a small bath can be made to look bigger with mirrored walls and better lighting. 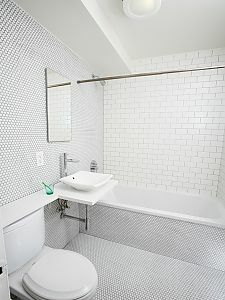 Quality workmanship shines through on our bathroom remodeling. We only use experienced master plumbers and electricians to build the comfort and elegance you desire. The makeover process starts with a visit and a careful study of your existing bath. N.P. Classic's creativity can turn an ordinary or out-of-date space into one of the most beautiful spots in your home. Sound exciting? Take the first step by contact us today for a complimentary in-home consultation.